I am Taro Aso, and today I was designated the 92th Prime Minister of Japan. To begin with, I would like to say a few words of greeting to the people of Japan. On this occasion, the grave responsibility of the premiership has fallen upon my shoulders, and I am already feeling its weight. In particular, I have taken sternly to heart the fact that we are in the midst of a crisis encompassing the people's anxiety about the economy, dissatisfaction about their daily lives, and distrust in politics. I consider that my mission is to make Japan a vibrant and strong nation. Accordingly, I pledge to rise to challenges ahead of us and to devote myself to overcoming them by bringing to bear all the experience at my disposal. In this, I ask you all for your support. Let me announce the new Cabinet lineup. In addition, I will briefly explain what I expect of each Cabinet member. The Minister of Internal Affairs and Communications and Minister of State for Decentralization Reform is Mr. Kunio Hatoyama. His primary task is to help the regions regain their vitality. I believe that decentralization reform will play an important role in shaping Japan in the future, so I want Mr. Hatoyama to promote decentralization by all possible means. The Minister of Justice is Mr. Eisuke Mori. The reform of the judicial system is only half finished and must be further promoted, and I am asking Mr. Mori to do that. The Minister for Foreign Affairs is Mr. Hirofumi Nakasone. There are a variety of diplomatic issues, such as the strengthening of the Japan-US alliance, North Korean issues, and the fight against terrorism, and I am asking Mr. Nakasone to tackle them. The Minister of Finance and the Minister of State for Financial Services is Mr. Shoichi Nakagawa. His tasks include the enactment of the supplementary budget, as a matter of course, and the implementation of measures to boost the economy, including the Comprehensive Immediate Policy Package that has just been released. In the financial sector, the series of recent developments that stems from the US subprime loan problem, including the collapse of Lehman Brothers, is drawing enormous worldwide attention. Given this, I consider it preferable for a single person to be at the helm of both the finance and financial services portfolios, rather than have two ministers dealing with them as separate issues. Therefore I have asked Mr. Nakagawa to take both posts. The Minister of Education, Culture, Sports, Science and Technology is Mr. Ryu Shionoya. The need to restore trust in the education system is not confined to Oita Prefecture alone. This problem has deep roots, but I want Mr. Shionoya to do whatever it takes to restore the people's trust in education. At the same time, although there are wide-ranging opinions concerning the improvement of basic education, Mr. Shionoya has been engaged with this issue for a long time, so I hope he will continue to grapple with it. The Minister of Health, Labour and Welfare is Mr. Yoichi Masuzoe. As everybody knows, we are faced with numerous problems in such fields as social security and food safety. Employment stability is also an important issue. There are also many other things that require attention, including the labor distribution rate, so I ask Mr. Masuzoe to study these issues and to continue working on them. The Minister of Agriculture, Forestry and Fisheries is Mr. Shigeru Ishiba. Japan's low food self-sufficiency rate and measures to safeguard against contaminated rice are among the pressing issues. Yet, Japanese agriculture produces many extremely high value-added agricultural products. I ask Mr. Ishiba to conduct agricultural policies on the offensive that take all of these matters into account. The Minister of Economy, Trade and Industry is Mr. Toshihiro Nikai. As you know, there are issues to tackle such as resource diplomacy and growth strategies for expanding industries that have the potential to become Japan's leading industries in the future. In the immediate term, the problems faced by micro-, small- and medium-sized enterprises are the most crucial from a national perspective, so I want Mr. Nikai to tackle these on a continuous basis. The Minister of Land, Infrastructure, Transport and Tourism is Mr. Nariaki Nakayama. It is public knowledge that opinion is divided on the issue of public works and reallocation of revenue sources earmarked for roads to the revenues used for general purposes. I would like Mr. Nakayama to grapple with this issue. The Minister of the Environment is Mr. Tetsuo Saito. He has been reappointed to continue in this post. With regard to global warming, from direct experience we clearly sense the existence of many problems. This year, we have yet to be hit by a typhoon. Some of you may have noticed this, but not even one typhoon has hit Japan. This is unprecedented. Four years ago, Japan was hit by nine typhoons in one year. In Japan, where we encounter an average of three typhoons per year, many people must feel that either no typhoons or nine typhoons in a single year is something abnormal. This is not a problem that can be resolved by Japan alone. It would be strange if we did not clearly perceive the major change that is going on around us. When we consider that Japan has held the G8 Hokkaido Toyako Summit and taken other initiatives, and that Japan possesses world-leading environmental technology, I believe that Japan is in a position that enables it to lead the world. So I hope Mr. Saito will continue to keep working hard on this issue. The Minister of Defense is Mr. Yasukazu Hamada. He has long been engaged in defense-related issues. With the entire world united in the fight against terrorism, Japan can on no account say that the issue of terrorism has nothing to do with our country. Although the horror of the Tokyo subway sarin gas attack incident may now be fading, that too was an act of terrorism. In consideration of such matters, we appreciate the importance of the fight against terrorism in a variety of dimensions, and I am relying on Mr. Hamada to take charge of this vital task. The Chief Cabinet Secretary and Minister of State for the Abduction Issue is Mr. Takeo Kawamura. He will be assisting me, and at the same time he will work on the abduction issue. The Chairman of the National Public Safety Commission and Minister of State for Okinawa, Northern Territories Affairs, and Disaster Management is Mr. Tsutomu Sato. Mr. Sato's tasks include the prevention of heinous crime. While the level of heinous crime is said to be quite low in Japan by developed country levels, abnormal crimes are clearly being perpetrated in Japan. In this sense, Mr. Sato's responsibility as the Chairman of the National Public Safety Commission is enormous. At the same time, natural disasters have been occurring that differ from what we have grown accustomed to in the past, such as localized falls of heavy rain as opposed to typhoons. Our disaster prevention plans were not formulated to cope with 100mm or 140mm of rainfall per hour. Mr. Sato will also be in charge of the development and promotion of Okinawa. The Minister of State for Economic and Fiscal Policy is Mr. Kaoru Yosano. He has been reappointed to continue in this post. I ask Mr. Yosano to work together with the Minister of Finance and Minister of State for Financial Services to implement a variety of fiscal policies and measures to promote economic recovery in the present severe economic situation, while maintaining an overall balance. The Minister of State for Regulatory Reform, Administrative Reform, and Civil Service Reform is Mr. Akira Amari. As you know, administrative reform, civil service reform and regulatory reform are currently moving forward. I hope Mr. Amari will proceed with the resolution of the outstanding issues. The Minister of State for Science and Technology Policy, Food Safety, and Consumer Affairs is Ms. Seiko Noda. She has been reappointed to the post. Securing food safety and the establishment of an Agency for Consumer Affairs are among the issues left unfinished by the Fukuda Cabinet. Ms. Noda is in charge of starting up the Agency for Consumer Affairs. The Minister of State for Social Affairs and Gender Equality is Ms. Yuko Obuchi, who will work on a number of items including measures to support young people and to ensure a zero-waiting list for nursery schools. This is my Cabinet lineup and the outline of my instructions to the ministers. In addition, I instruct the entire Cabinet on the following points. First, proceed with policies focused on the people. Second, exercise effective command over the civil servants in your respective posts. And third -- there is no limit to the number of things I could mention but -- keep in mind the national interest. Ministers should focus not on the interests of their ministries but on the national interest. The most important thing is to focus on the national interest. The Cabinet Secretaries are standing by me here, so let me introduce the four of them. First, here is the Chief Cabinet Secretary Takeo Kawamura, who I mentioned earlier. Also, let me introduce Deputy Chief Cabinet Secretaries Jun Matsumoto, Yoshitada Kounoike, and Iwao Uruma. Question 1: The Cabinet lineup creates a strong impression that it consists of your own personal connections. The House of Representatives will be dissolved and the general election will be held within one year even if the present administration is dragged out for as long as possible. In what ways did you place emphasis on building the structure to counter the Democratic Party of Japan (DPJ) led by President Ichiro Ozawa? Please let us know specifically how you intend to tackle the general election with this Cabinet. PRIME MINISTER ASO: Different people say different things about personnel allocation but I think the basic idea should be placing the right person in the right place. This is the way to meet the expectations of the people. Basically, we will fight the next election with the current Cabinet lineup. If you are asking me how we will fight, we will fight openly and squarely. Question 2: Let me ask you about the deliberations on the supplementary budget and the general election for the House of the Representatives. The DPJ has shown its willingness to participate in the deliberations on the supplementary budget. What is your timeline for enacting the supplementary budget? PRIME MINISTER ASO: It would be good if they participate in the deliberations. Please go on. QUESTIONER: In connection with that, regarding the general election for the House of Representatives, the scheduling of an official announcement on October 21 and a vote on November 2 is regarded as a very likely scenario among members of the ruling parties. What do you think of the timing of the election for the House of Representatives? PRIME MINISTER ASO: Regarding the supplementary budget, we will respond to the current economic slump at least with emergency economic measures. In particular, one of the pressing issues is the issue of the so-called micro-, small- and medium-sized enterprises worrying about their cash flows toward the end of the year. These issues stem from the surge in the price of oil or are generated by the subprime loan problem. There are various ways to describe the situation, but one thing is for sure: the economy is stagnant this year. Accordingly, we must consider how we address these issues. For that reason, it is vital that the opposition takes part in the deliberations on the supplementary budget. I would appreciate it if they could do so, but frankly speaking, developments over the last year have left me feeling that, on many occasions, they did not keep their promises. Although members of the opposition in the House of Councillors have made many remarks, I actually doubt whether they will carry them out. As such, I will consider the timing of the general election, taking into account whether or not they will take part in the deliberations. Question 3: I would like to ask you about the refueling activities. During the LDP presidential election campaign, you often indicated the importance of the continuation of the activities in the Indian Ocean. This will also relate to the timing of the dissolution of the House of Representatives and the general election, but the legislation will expire in January of next year. What do you intend to do to ensure the continuation of the operations? The Fukuda Cabinet extended the term by putting the issue to a second vote of the House of Representatives. Do you intend to take the same step with your Cabinet? PRIME MINISTER ASO: Nearly 90 percent of the oil imported into Japan is transported via the Indian Ocean. In the fight against terrorism, Japan takes part in the maritime refueling activities in the Indian Ocean to prevent any assistance to terrorists from coming from the sea in the context of the current regional issues including the border between Afghanistan and Pakistan. Our activities are not for the sake of Afghanistan or the United States or Pakistan. We must decisively keep fighting against terrorism, which the whole world is fighting. That is a natural obligation of Japan as a member of the international community and this, as I understand it, is a field in which the highest expectations are placed on Japan. Accordingly, while there are many things we should do, such as protect oil transportation, we must continue this mission, for on this matter the world has the greatest expectations of Japan. Whether we use the power of two-thirds for that purpose depends on the opposition's intentions. Whether they are definitely against it, no matter what, I will decide after I have observed some more of their response. By the opposition I mean the DPJ, and I will make my decision based upon their response. Question 4: You have appointed Mr. Shoichi Nakagawa to the posts of Minister of State for Financial Services as well as Minister of Finance. Let me take this opportunity to ask you to explain the reason. I understand that the so-called separation of fiscal and financial duties was implemented under the Hashimoto administrative reform. Does the appointment imply any criticism of that reform? At present, it is only the ministerial positions that are combined but do you think that the respective staffs also should serve in the same office in the future, as they did at the time of the former Ministry of Finance? PRIME MINISTER ASO: I do know how fiscal and financial duties came to be separated, but we must at least take into consideration that global finance is facing a crisis. Japan may not have suffered as much as some other countries, but it is still true that it has suffered wounds in its own way. If this problem were to be discussed at an international conference of finance ministers, no other country would be represented by a minister who said, "I am not in charge of financial affairs." That is why I have thought, since the financial crisis occurred, that one person should take both positions. That is the background. Questioner: Do you think the offices should be unified? PRIME MINISTER ASO: Whether or not the offices should be unified cannot be known before they have been unified. I cannot comment on whether or not the offices should be unified until I have studied how the work can be done in actuality. Question 5: Let me ask you again about your policy, which became a subject of discussion during the LDP presidential election campaign. Concerning the target of achieving a primary balance surplus in FY2011, does your standpoint remains unchanged that the FY2011 target can be postponed if there is a need for it to be? And if there is the need, will you make a Cabinet decision to revise the plan? On a related issue, will you carry out an increase in the Government contribution rate for the basic state pension in April of next year as scheduled? What are you going to do about the financial resources to fund this increase? PRIME MINISTER ASO: It is the Government's commitment to contribute half of the basic pension contribution, so I will carry this out. As for the primary balance, I think you remember the precondition for achieving a primary balance surplus by 2011 -- at least 3 percent economic growth. That was the precondition at that time, at least. The current situation, however, is that we may have growth of minus 3 percent. In those days, there was not a financial problem. There was no surge in the price of oil. When I consider these things, if you ask me whether we can achieve a primary balance surplus surely and quickly while ignoring the reality that the preconditions have changed greatly since the time we announced the goal of achieving in FY2011 a primary balance surplus, my frank feeling is that the situation has changed drastically. It is certainly not wrong to set the target, but we cannot ignore the reality that the preconditions for achieving the goal have largely gone awry. What was your other point? QUESTIONER: IAbout the Cabinet decision to revise the plan. 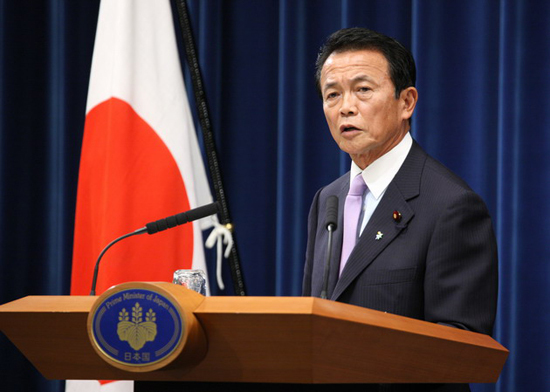 PRIME MINISTER ASO: I have no immediate intention of making a Cabinet decision to that end. QUESTIONER: To raise the State's contribution to the basic pension in the next fiscal year means raising it in April of next year, doesn't it? PRIME MINISTER ASO: Yes. That's how it was written, as far as I recall. QUESTIONER: Then, how will you secure a stable supply of financial resources? PRIME MINISTER ASO: That is something that we are going to study now. What to allocate as necessary financial resources for funding the increased pension contribution is an important matter that the Minister of Finance will at least have to consider from now. Question 6: You appealed as to the necessity of inter-party talks during the LDP presidential election campaign while reinforcing a confrontational approach to DPJ President Ozawa. Are you considering holding party leaders' debates or having direct exchanges with DPJ President Ozawa at an early stage? PRIME MINISTER ASO: I have served twice as LDP Secretary-General, and I think I said the same thing when I acted as Secretary-General the first time and again when I took over the post for a second time this September. At the very least, the Diet is now in a contorted situation in which the House of Representatives and the House of Councillors are controlled by opposing parties. There are other countries around the world that have contorted parliaments. However, democracy has matured in these countries to the extent that dialogue is conducted properly between opposing parties and reasonable agreements are made concerning matters that are truly necessary in the interest of the people. In Japan, however, the situation has not quite reached that level of maturity, and I think this is a source of great dissatisfaction from the people's standpoint. There are many ways to hold talks, such as through party leaders' debates and direct dialogues. Also, I think it is important that discussion can take place in a variety of places, such as in the plenary sessions and in committee. At least, the single-seat constituency system was introduced with the intention of realizing a two-party system. Based on these things, I consider inter-party talks and party leaders' debates to be essential if proper negotiations are to take place, and I feel I must make an appeal for such things to be embraced.